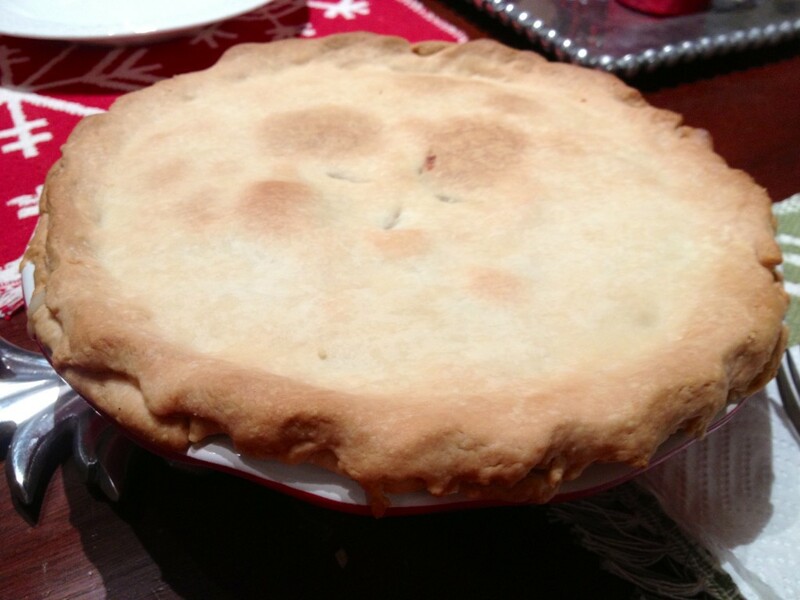 The first time I made this chicken pot pie recipe we were having new friends over to our home. I’m pretty sure when they walked in every surface in my kitchen was covered with pans, measuring cups, and flour. I am happy to say the end product looked much better. Since then, I have made this recipe quite a few times and it has never let me down. I have also managed not to destroy the entire kitchen trying to make it. Tip: I used leftover chicken from my Roast Chicken from last night to make prep simple. I also added a little of the chicken drippings in with the butter to add more flavor. Heat oven to 425 degrees. Follow directions on the box to make a Two Crust Pie. Use a 9-inch glass pie pan. In a 2-quart sauce pan, melt butter over medium heat. Add the chopped onion and let cook for 2 minutes, stirring frequently. Stir in the flour until it combines with the butter and the mixture becomes thick. Then, gradually stir in the milk and the chicken broth. Add in the salt and pepper. Stir and cook until the sauce thickens and it begins to bubble. Stir in the mixed vegetables and the chicken until combined. Pour the chicken mixture into the prepared pie crust. Cover with the second pie crust, pinching the edges to seal the crusts together. Cut four slits in the top. Bake 30-40 minutes or until the crust is golden brown. Make sure you check on the pie after about 20 minutes. I take mine out and put foil around the crust edges to keep them from burning. Then, I put it back in the oven to finish cooking. When it’s done take it out and let it rest 5 minutes before serving. I hope you enjoy this chicken pot pie as much as we do! This recipe was cooked with love by TSB, but was created by Pillsbury. Click here for the original recipe.